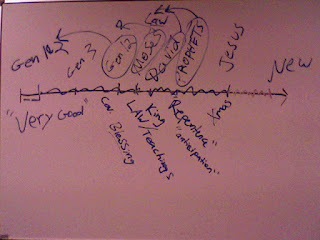 Last night I taught the Adult Bible Study at our church for the first time. It was part of a three part series which my step-dad, Hal Mortier, is teaching on the advent season. His plan has been to teach scripture using a particular Christmas Carol as the guideline. The first week was on "Mary Did You Know," so we sang the song and then talked about who Mary was, what she did and didn't know, etc. This week Hal was supposed to teach "What Child is This" discussing Jesus and who He was and is but he was called to go to New York for business and so he asked me to teach. I didn’t think it was fair that he got to teach a concise message on a character to which only a few chapters of scripture are devoted and I was now supposed to talk about Jesus… a bit broader a subject. Anyway, I will post the study here. Have a listen and let me know what you think. then click "download this file"
Where are the little pictures in that diagram? Haha, I thought those were important, haha. Looks familiar, still. These were old people. I didn't want to overwhelm them with pictures. That's too technologically advanced.